A Sandbox-Adventure-Pirate RPG! Capture islands, sink ships, defend your towns, and discover an exciting world full of adventure! Hitcents appears to be pretty big fans of the Switch. They've already released some titles on the platform, and we know Don't Sink is coming soon. In an interview with Miketendo64, Hitcents' Jordan Taylor discusses what it was like bringing Don't Sink to Switch. He also talks about future Switch support from Hitcents, which looks to include EPIC 3. Miketendo64: Having previously released on the likes of Steam back in April of 2018, when did the decision take place to bring the game to Nintendo Switch and how long did the game take to port? Jordan Taylor: We actually first started talking back in May, right after the game had launched on Steam. The plan was in place for several months before they were able to start working on the port. YoYo Games had not yet released the Switch module for GameMaker into open beta (they were using Undertale to test and sort through major issues, I think), but once they did, the team was able to move forward pretty rapidly! The bulk of the work might have taken a month (primarily on Sebastian’s shoulders), with time on top of that spent isolating and squashing odd bugs that cropped up. Miketendo64: Being a port, was anything needed to be sacrificed in order to get Don’t Sink working on Switch, or was it a straight forward affair? Jordan Taylor: The biggest sacrifice I can think of right now is having to lose some water reflections. FPS was suffering as a result of them being in-game, so we had to remove them. It’s a shame because the reflections were a really nice aesthetic touch! Otherwise, the game is still 100% original and complete. It did take a few attempts to pass the certification process; GameMaker’s export module wasn’t fully optimized at the time, so some hiccups were expected in terms of successfully passing all the individual Lotcheck guidelines. Silver lining is that we could pass back any oddities we encountered to the team at YoYo Games so that they could fix as needed, which hopefully helps other GameMaker titles coming to Switch! Miketendo64: After the release of Don’t Sink for Switch, what is next for Hitcents? Any chances of there will be a port or two of any of your other previous titles? Jordan Taylor: I couldn’t tell you an exact number off the top of my head, but we’ve got at least 5-6 other games lined up this year  alone for the Switch and other platforms (some are announced, some unannounced), and a few more titles lined up beyond that. It’s so exciting working with all our dev partners based all around the world (Spain, Chile, Japan, Czech Republic, here in the US). They are doing some fantastic work, and I think fans will be really intrigued when they see these games. Miketendo64: Given the fact that Draw a Stickman: EPIC 2 released on both Wii U and Switch, how did the Switch release do in comparison? Is it enough to warrant developing a Stickman game just for Switch? Jordan Taylor: The Switch release has absolutely crushed the Wii U’s numbers. Currently, EPIC 2 on Switch has sold over 10x as many copies as the Wii U version. In terms of future Stickman titles, we do have plans for EPIC 3 to be a multiplatform launch (the marketing team is gonna scold me for subtly announcing EPIC 3, hah!). 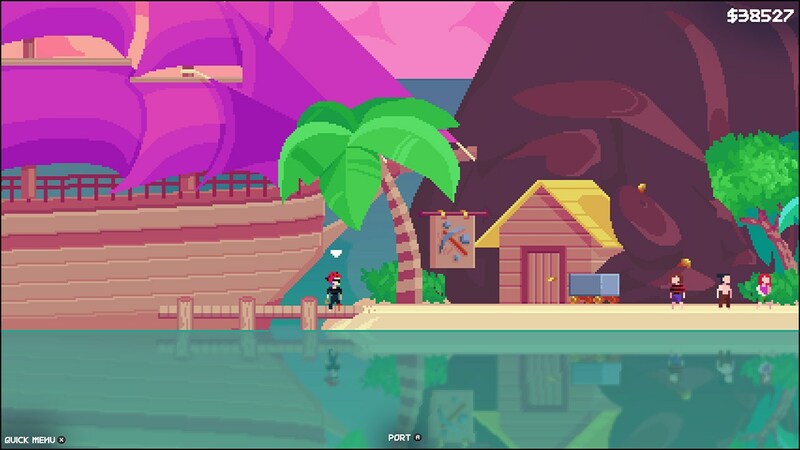 Bowling Green, KY (09/19/18) - New seafaring adventure Don't Sink launches on Nintendo Switch later this year! Are you a scallywag at heart? Does humorous, salty dialogue tickle your fancy? Do you like the idea of being a pirate without all the messy parrots and constant threat of scurvy? Do you enjoy these nautically-themed questions? Ahoy! We have just the game for you! We are excited to announce our partnership with Studio Eris. Together, we're bringing their pixel-perfect pirate RPG Don’t Sink to Nintendo Switch this fall (official date TBA - follow us on Twitter for alerts!). Don’t Sink is a lighthearted Sandbox/Adventure/Pirate RPG offering a massive world of unique islands and landscapes to explore and conquer. Unlock larger and more powerful vessels by sailing the seas and completing quests. Maintain the morale of your mangy crew with food and fighting. Discuss rumors with citizens and uncover the origins of each island. Solve your conquered islands’ economic challenges and become a respected governor. Thanks to AstronoLukeNX for the heads up!